Jacob Rosen demonstrates the latest prototype of his exoskeleton arms, for which he envisions a variety of therapeutic uses. Photo by J. MacKenzie. Jacob Rosen, associate professor of computer engineering at the Jack Baskin School of Engineering, University of California, Santa Cruz, is developing a wearable robotic "exoskeleton" that could enable a person to lift heavy objects with little effort. It's a bit like the robotic armor that has long been a staple of futuristic battle scenes in science fiction books and movies. But what excites Rosen is the device's potential to help people disabled by stroke or degenerative diseases. "People with muscular dystrophy and other neuromuscular disabilities could use the exoskeleton to amplify their muscle strength, and it could also be used for rehabilitation and physical therapy," Rosen said. "One of the major challenges in this field is to establish an effective human-machine interface, or 'bio-port,' between the operator and the wearable robot, such that the robot becomes a natural extension of the human body," he said. "This bio-port may be established at the neural level, allowing the human brain to control the wearable robot with the same type of signals that it uses to control its own actuators, the muscles." Rosen joins a growing number of faculty members in Baskin Engineering who are using their expertise to tackle biomedical problems. 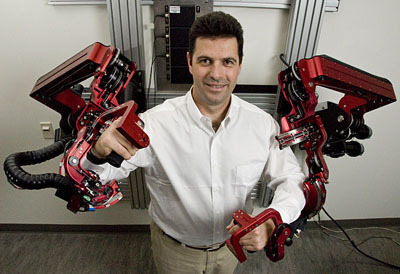 Rosen's research focuses especially on the interface and interaction between humans and robots. "Medical robotics is by definition a multidisciplinary field, and that's one reason I was so attracted to it," he said. "One of the most challenging issues in research and development of medical technology is to create a multidisciplinary group of clinicians and engineers that can effectively communicate and collaborate. We speak different languages, and we have to overcome these barriers in order to work together. But the opportunities to benefit people's lives are tremendous." Rosen is also engaged in projects to develop robotic systems for performing surgical operations. "This is a huge challenge. I'll probably spend a large part of my career on this," he said. The Jack Baskin School of Engineering at the University of California, Santa Cruz, prepares technologists--and sponsors technology--for our changing world. Founded in 1997, Baskin Engineering trains students in six future-focused areas of engineering: biotechnology/information technology/nanotechnology; bioengineering; information and communication infrastructure; mathematical and statistical modeling; software and services engineering; and system design. Baskin Engineering faculty conduct industry-leading research that is improving the way the world does business, treats the environment, and nurtures humanity.